In case you haven’t figured it out already, I’m Italian. My paternal grandparents emigrated from Bologna and Naples, Italy and my maternal grandparents arrived from small villages in Sicily. Depending on whose home in which we were eating, there would be styles of cooking ranging from the lighter and sophisticated cooking from Northern Italy to the North African influenced Sicilian styles, and just about anything Italian in between.We only ate italian food–I didn’t even know there were other food cultures until I was in high school. 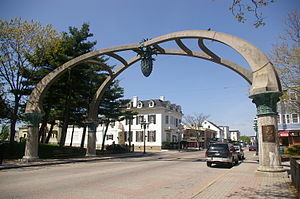 My two grandfathers owned an Italian Restaurant in the Italian neighborhood called Federal Hill in Providence, Rhode Island. When we ‘went out’ for dinner, we went to the family restaurant and ate italian food. The only difference was my grandfathers prepared the food instead of my grandmothers. My friends were italian, and I ate italian at their houses when I visited. My Uncle Mario married Aunt Bobbi. She was Irish, and the first non-italian in the family–a very difficult position to hold. She suggested we try irish stews, corned beef and cabbage and other non-italian dishes, but my grandmothers were in charge of the food. They ate Italian. Therefore, there was very little chance of anything irish, french, mexican or any other culture ever making it to the Sunday Supper table. Besides, my Uncle Mario didn’t like anything that wasn’t italian either. That’s just the way it was. Everything was homemade, including the linguine, paparradella, or macherroni for every Sunday Supper. We ate at one of my grandparents home every Sunday, and attendance was mandatory. If you missed one of the Sunday Suppers, you better be in the hospital, in jail or dead, because…well just because!My two sets of grandparents were great friends, creating a wonderfully fun and safe environment to grow and learn about the food culture of our extended italian family. And I was also the first grandson, a very privileged place in the family, except at meal times. That’s because my grandmother’s routinely competed for the ‘favorite meatball’, or the ‘best pizza’, the lightest homemade gnocchi or the best sour cream coffee cake, my favorite childhood sweet. And I found out early on that if I told one grandmother her meatball was the best ever, it wouldn’t be long before my other grandmother was making her best meatball recipe. As you can imagine, I wasn’t leaving the table until I said IT was the best meatball ever. So at the ripe young age of about 10, I learned how to become a politician–mainly from my mother who had learned over many years how to keep peace among the grandmothers. What my mother taught me was how to be more attuned to the ingredients in the food my grandmothers prepared. That would give me an edge on staying out of the ‘favorite’ battlefield. I’d say, “Grandma, I love the lemon rind you put in your meatballs–makes them special and just great”. To my other grandmother, I’d say, “Wow Grandma, those pine nuts in the meatballs are just a great idea–I love them!! I told one grandmother her Neapolitan thin, crusty and simply dressed pizza margherita was “like nothing I had ever eaten before”. 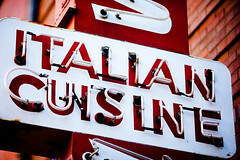 I told the other grandmother that her Sicilian-style pizza, thick and covered with tomato sauce, anchovies, black olives and garlic was ‘like nothing I had ever eaten before”. Clever huh? I became quite adept at the politics of staying Number One Grandson for both grandmothers, and at the same time learned how to pick out every ingredient in their recipes. A skill I still use today to duplicate dishes I’ve liked at restaurants or other people’s homes. 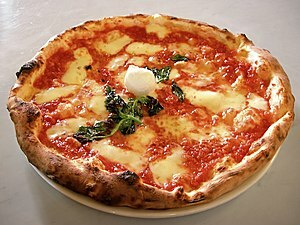 Now that my grandmothers have passed into the Big Italian Kitchen in Sky–I am absolutely certain every street corner in Heaven has an Italian Restaurant run by all our italian grandmothers–I can admit that my one and only favorite pizza is my paternal grandmothers Pizza Margherita. It is one of those simple pleasures in life that can and should appropriately be different every time it’s made, even though it only requires four ingredients: extra virgin olive oil, tomatoes, mozzarella cheese and basil on a thin crust. Somehow, with just these four ingredients, the taste is interestingly and subtly different each time I make it. Sometimes the fresh tomatoes are slightly sweeter than the last time, or I use San Marzano tomatoes out of the can. When I can get it, I use Buffalo mozzarella instead of the ‘regular’ mozzarella. During the winter, the basil comes from the grocery store rather than from my garden. But the beauty of this pizza is it’s sophisticated and simultaneously simple; it has many layers of taste from the nicely browned crust, the aromatics emanating from the baked olive oil and tomatoes, the cheese and the basil, all melted together, but individually tastable. My grandmother always made her own dough, and it was the best. I’ve made my own in the past, but to tell the truth, it’s not something I like to do, and my shortcut works great every time! I buy it from the local pizza shop that makes the best thin crust pizza in town. Most of them will sell it to you for a reasonable price. Try Whole Foods or Trader Joe’s fresh pizza dough–it is also very good. I know this recipe looks daunting. Nothing could be further from the truth. I’ve just put the steps in detailed explanations so you cannot screw it up–even if you try!! I guarantee that if you pull out this recipe on a Friday night after work, have a glass of wine or a beer with some cheese and crackers while the dough is getting ready, and throw together a Simple Salad (See Blog Recipe Index), you will have the ingredients for a fantastic at-home evening with a special someone admiring your cooking prowess. At the suggestion of one of my Blog Followers, I tried cooking this Pizza on a hot outdoor grill. It worked incredibly well. Just heat the Grill to 500 degrees F, and you must use a pizza stone in the Grill. The cooking time will be about 2/3rds of what this recipe calls for. Check it frequently to make sure it doesn’t burn. Try it–you gonna like it! 1. Preheat oven to 500 degrees F and, if you have one, place a pizza stone (a good investment if you make this often enough) on the bottom rack of the oven. I’ve even used thin bricks I bought from the hardware store, washed them and placed them in an old cookie sheet to heat up in the oven. It works really well. Otherwise, you can bake the pizza in a dark cookie sheet. 2. If using shop bought or fresh store-bought dough, follow Steps 7, 8 and 9 in the below Basic Pizza Dough Recipe. If using frozen dough, follow the packaging directions. 3. Cut the dough in half, and use your fingers and the palm of your hand to gently stretch the dough on a floured surface. Don’t use a rolling-pin– it compacts the dough and squeezes all the valuable air bubbles out. 4. When the dough is about 12 inches round, its thin enough. Don’t worry if it’s not perfectly round–rustic is preferred. 5. Carefully transfer the dough to the thoroughly cleaned BOTTOM of a cookie sheet or to a pizza paddle (peel). 6. Scatter the sliced tomatoes or place a light coating of the San Marzano tomatoes over the top. If using can tomatoes, be careful not to use too much of the juice on the pizza–it makes the dough mushy when cooking. 7. Drizzle the extra virgin olive oil over the tomatoes. 8. Sprinkle sea or kosher salt and several grinds of fresh ground pepper over all. 9. Spread the basil over all. 10. If using, sprinkle the Parmesan-Reggiano cheese over the top. 11. Carefully place the mozzarella cheese over the top. Do not cover the whole pizza with cheese. 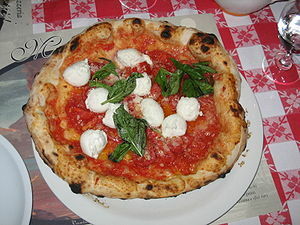 The mozzarella is intended to be ‘islands’ of white in a sea of red tomatoes. 12. Transfer the pizza on the cookie sheet to the oven, or slide the pizza onto the hot stones in the oven. 13. Bake for about 8 minutes, or until cheese is bubbling, the edges are golden brown, and when you lift the bottom edge, there’s a slightly burnt appearance. 14. Remove pizza from oven by sliding it onto the pizza paddle or using tongs to ‘pull’ it back onto the back of the cookie sheet. Let it sit for about 5 minutes while ou get a nice cold Peroni Beer, Coca-Cola or Italian red wine. 15. Slice and think about your grandmothers cooking when you were a kid– it was just like this pizza, but just a little different. 1. In the bowl of a heavy-duty mixer, stir together the water, yeast and sugar; let sit until the mixture is foamy, which takes about 5 minutes. 2. Add 1 1/2 cups of the flour, the oil and salt into the yeast mixture and, using the paddle attachment, combine until mixture is smooth. 3. Switch to the dough hook. 4. With the machine running at low, add remaining flour, 1/4 cup at a time; make sure each addition of flour is incorporated before adding the next. 5. Once all the flour has been added, turn up the speed and let the machine knead the dough for about 3 minutes; it should be very smooth and perhaps a bit tacky. 6. Don’t be afraid to knead the dough an extra minute or two by hand if you wish; it won’t hurt the dough at all. 7. Rub the insides of a large mixing bowl with a little olive oil; remove dough from machine, form into a ball, and place into oiled bowl, turning dough over to make sure all sides are oiled. 8. Cover bowl with plastic wrap and place in a warm, draft-free area to rise; the dough should nearly double in size, which will take about 60 to 90 minutes. 9. I place a towel around the bowl, just to make sure no drafts get to the dough. A. Go to the local pizza shops and find one that’ll sell you their pizza dough. You’ll find one or two. It’ll coast about $2 or $3 a pound, but it’s worth the money and little effort. B. Some of the fresh store-bought pizza dough is really good–try Whole Foods or Trader Joes–you’ll not do better making it yourself. C. Of course, this is a basic pizza recipe as well. Add some italian sausage or a few pieces of peperoni for a change of pace. Try mushrooms or spinach with ricotta cheese instead of mozzarella. Guys–this is all about what you and your special lady like. Don’t be afraid, just try it!! D. I tried cooking this Pizza on a hot outdoor grill. It worked incredibly well. Just heat the Grill to 500 degrees F, and you must use a pizza stone on the grill grates. The cooking time will be about 2/3 rds of what this recipe calls for. Check it frequently to make sure it doesn’t burn. Another Nights Pizza Margherita with the same four ingredients, a different presentation, but the same great tastes. Categories: Great Menus, Great Recipes, Loving Life! My favorite pizza as well, Lou. We have been making pizza for years, and each time it tastes different. Lately we have been trying to perfect it on the gas grille – which is a challenge to do without burning it. It does taste a bit more like the real brick oven pizza – better than our pizza stone! Loved reading about your manipulation of your grandmothers – you sure did learn early on in life!!! ;>) Best to you and Kathy! Thanks Priscilla. I have indeed tried to do pizza on the grille and I too have had a hard time not burning it. It does taste more like the real thing, but I can never quite get the cheese to melt before the bottom gets too cooked. I’m working on putting bricks designed for furnaces to work. I’ll let you know how it comes out. Yes I learned how to manipulate early and now in my old age, I get called out for doing it. Funny how life throws changes in attitudes. Take care. Thanks Priscilla–I’ve tried the grille a couple times but getting everything to cook and melt at the right time is hard. Hope all is well. Loved this one. It was truly personal and one that I could relate to in many ways. Thanks Charles. I knew you would like this one. And I know you love Margheritas.